One winner has already been decided even before play starts at the WTA Finals in Singapore: Simona Halep. The 26-year old Romanian has topped the “Porsche Race to Singapore”, the official qualification for the super tournament where the season’s eight most successful players will be competing. She has received a Porsche 911 Carrera GTS as the prize for the winner. The WTA Finals will be staged in the Singapore Sports Hub from 22 to 29 October. “It’s been an unbelievable season for me this year and being crowned winner of the Race to Singapore is a very proud moment,” said Halep holding the key for the carmine red 450 bhp sports car. 2017 has been her best ever season – she won the tournament in Madrid and, in addition to reaching the final of the French Open, she was also the runner-up in Rome, Cincinnati and Beijing. 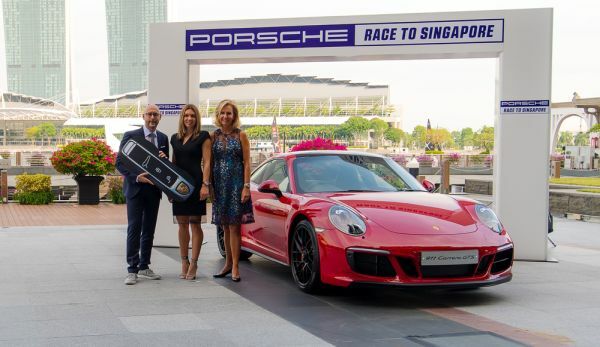 As a part of its global partnership with the Women’s Tennis Association (WTA), Porsche became the new title partner of the “Porsche Race to Singapore” and the exclusive automotive partner of the WTA in April 2017. The car maker thus intensified its good long-standing cooperation with the body governing women’s tennis. For Porsche – the sponsor and organiser of the Porsche Tennis Grand Prix, which has been regularly voted by the players as their favourite tournament, since 1978 and 2002 respectively – it is another step towards internationalisation and expanding its successful engagement in women’s tennis. “For us, it’s important to be visible worldwide in women’s tennis throughout the year, something we succeed in doing with the ‘Porsche Race to Singapore’,” says Detlev von Platen, member of the Executive Board responsible for Sales and Marketing at Porsche AG. The “Porsche Race to Singapore” is the official qualification ranking for the WTA Finals. The eight most successful singles players and doubles pairings earn the right to compete at the year-end tournament that has been held in Singapore since 2014. The 16 best results for every player at the year’s 57 tournaments (53 WTA events plus four Grand Slams) played in 31 countries count towards the “Porsche Race to Singapore”. The player heading it at the end of the season with the most points not only secures a starting berth at the WTA finals, she is also rewarded with a sports car from the title sponsor.